3" 1 - 0 : It's wonderful play from Sadio Mane as he plays a one-two on the edge of the Leicester area at the end of a 30-pass move before curling a sumptuous shot into the far corner beyond Schmeichel. Liverpool in front before Leicester even had the chance to touch the ball. 45" 1 - 1 : And there is a twist in the tail for Liverpool! The free-kick is whipped into the area, it cannons around before a second cross is sent back in. A handful of Leicester players are offside but Harry Maguire isn't as he ghosts in at the back post to calmly finish into the bottom left-hand corner to stun Anfield. Shaqiri 4, Salah 5, Firmino 6, Mane 6. Subs: Fabinho 6, Lallana 6, Sturridge 6. Leicester City FC : Schmeichel 6, Ricardo 7, Evans 7, Maguire 8, Chilwell 7, Albrighton 7, Mendy 6, Ndidi 6, Maddison 6, Gray 6, Vardy 5. Subs: Choudhury 6, Okazaki 6, Okazaki 6. 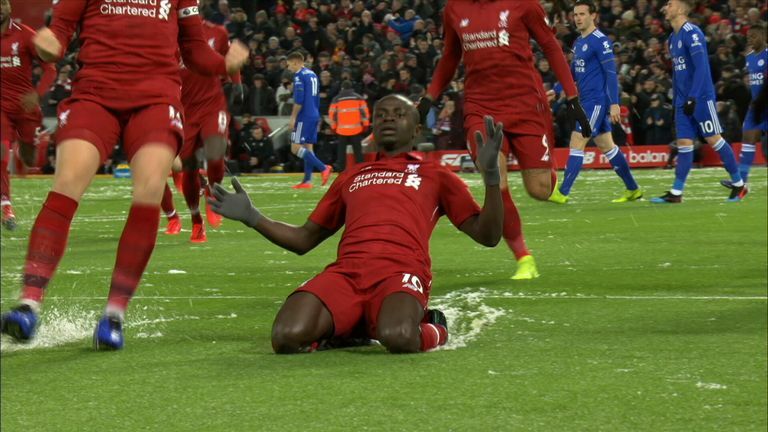 Liverpool have won their last three league games against Leicester - they last won four in a row against them between February 1987 and September 1996. Leicester have lost six of their last seven away Premier League games against Liverpool (D1), with their last win at Anfield coming in May 2000 (2-0). Liverpool haven't lost any of their last 19 home midweek games in the Premier League (Tuesday, Wednesday, Thursday), winning 13 and drawing six since a 0-1 loss vs Fulham in May 2012. Liverpool are looking to win eight consecutive Premier League home games for the first time since March 2010. The Reds conceded as many goals in their last home league game against Crystal Palace as they had in their previous 15 at Anfield combined (3). Leicester have lost each of their last 11 Premier League games against sides starting the day top of the table, conceding at least twice every time (27 in total) and netting just five in return. Their last such win came on January 31, 1998 at Manchester United.